Buddhas and Bodisattvas and frequently other deities are shown with their hands forming a number of different ritualized and stylized poses (Mudras). They may be holding different objects as well within these poses. Each by itself and in combination with others have specific meanings. So are you curious about the meaning of specific Buddha hand gestures? Do you have several Buddha sculptures in your home and would like to find their best feng shui placement? You’ve come to the right place. Each of these Buddha gestures is called a “mudra”. In Sanskrit, the word “mudra” (literally, “seal” or “mark of identity”) is a form of non-verbal communication that refers to symbolic gestures imbued with varied spiritual meanings. Common to both Hindu and Buddhist iconography, mudras are typically expressed with the hands and fingers and sometimes with the whole body. In Buddhist iconography, mudras invoke specific aspects of Shakyamuni or other buddhas (for example, as teacher, protector). They are extensively used during prayer rituals and mantra recitations. 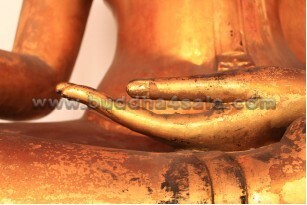 It is believed that mudras enable the practitioner to experience a connection with the Buddha being invoked. In the Buddhist Tantric tradition, the right hand represents skillful, focused method of action and the active male principle. The left hand symbolizes wisdom, emptiness and the contemplative female principle. Thus, we find many images of the Buddha where his right hand is portrayed in gestures actively signifying teaching, protection and granting blessings, while his left hand reposes meditatively upon his lap. The explanation of some of the more common ones are depicted below, along with FengShui tips for their Most Auspicious Location will definitely help you.